Villa Surya Damai is a sublime introduction to Bali villa living. 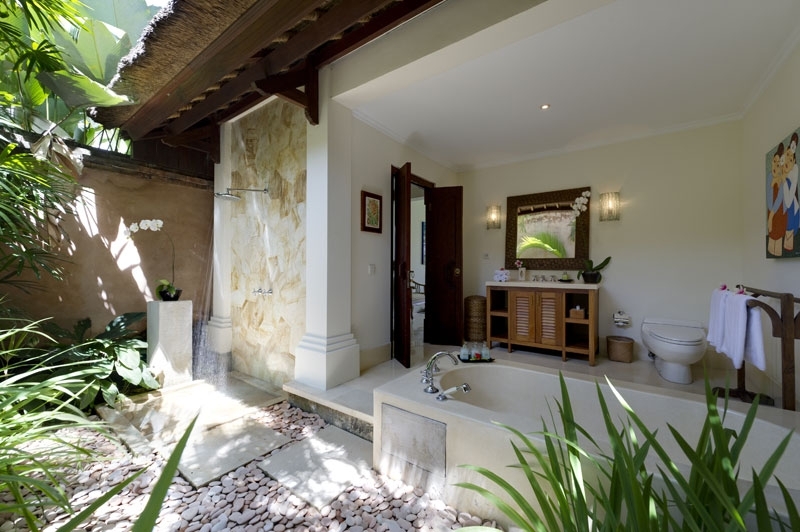 This delightful five-bedroom property comes uniquely infused with touches of colonial elegance, high quality interiors and furnishings and all the modern creature comforts required for the perfect tropical villa holiday. 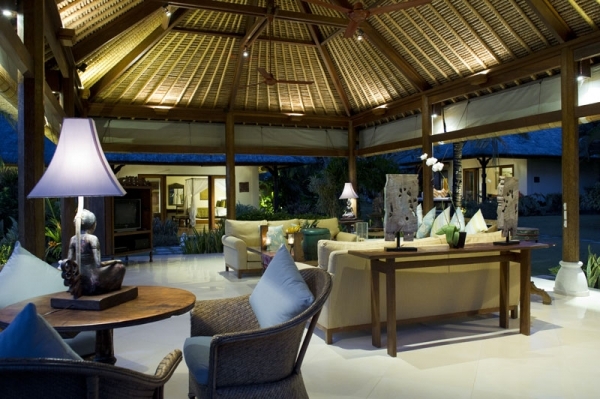 Essentially, Villa Surya Damai is a much-loved private family residence that promises to make guests’ modern- day stresses melt away. Here, classic good taste mixes with understated simplicity and ample luxury is supplied without overwhelming hi-tech gadgetry. 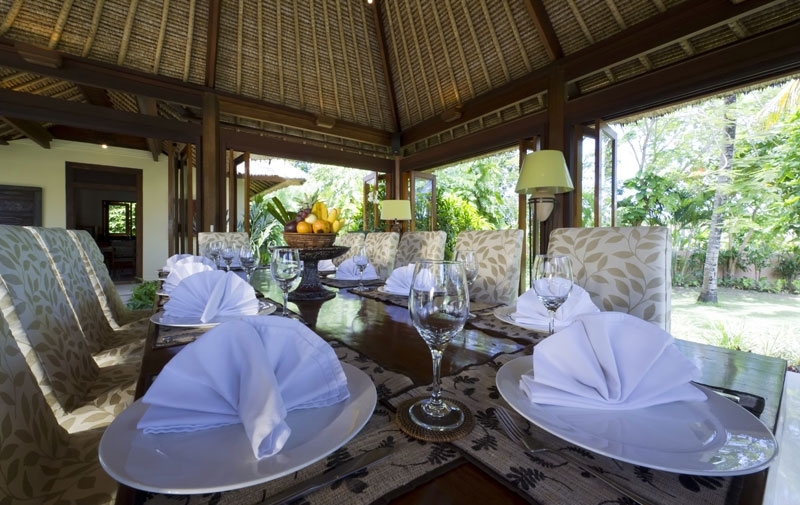 The ever-happy team of staff are further evidence that is indeed a relaxed ‘home from home,’ welcoming with warmth and informal hospitality. 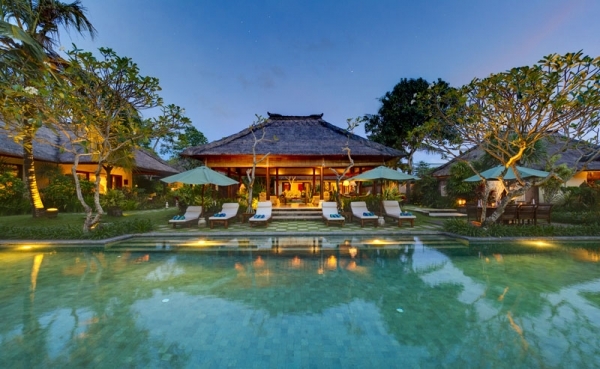 Set out amongst 2,750sqm of mature, tropical riverside gardens, the property consists of a series of charming thatched pavilions in the design of a traditional Balinese family compound home. 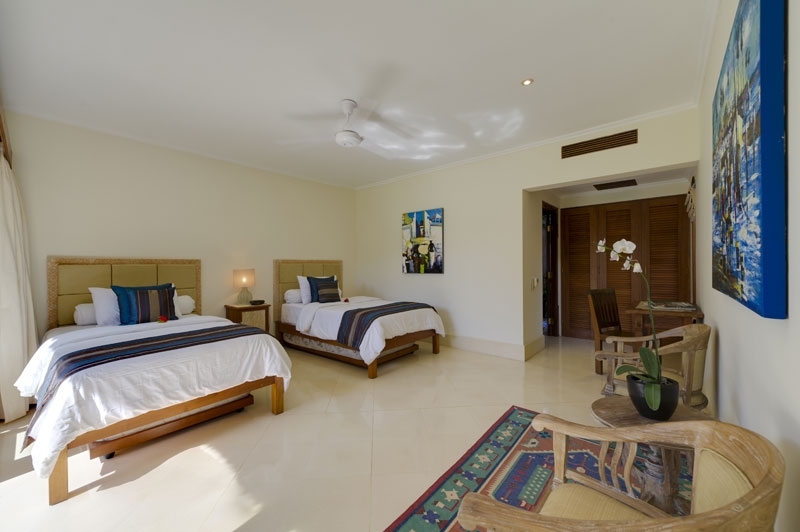 Spacious bedrooms, private terraces and pretty ensuite garden bathrooms, encircle a welcoming, open-sided living pavilion while pool loungers, outdoor and indoor dining areas and an additional lounge–TV room on an upstairs veranda, provide more than enough options for both private and social moments. Recreational facilities include three TVs and DVD players, iPod docking and sound systems, a hard-surface tennis court and an inviting 18m natural-stone- lined pool. 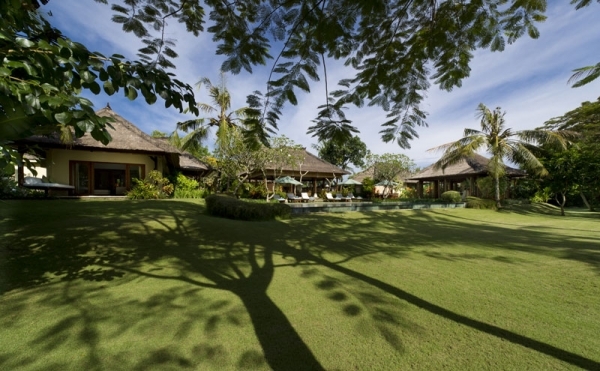 Beyond the enchanting gardens and swaying palm fronds lie terraces of verdant rice fields on one side and a grassy pasture complete with grazing cows on the other. It’s a quiet spot, where days blissfully blur together. 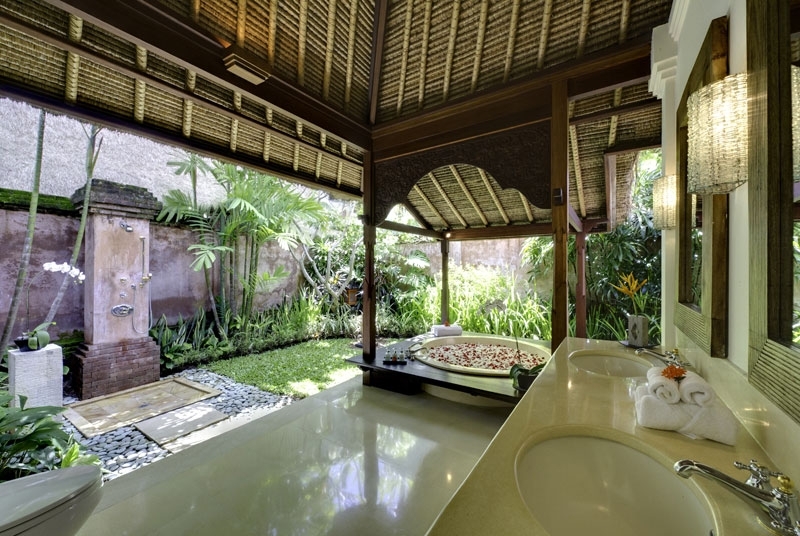 But if you do feel the urge to venture out, the villa is just a few minutes’ drive (or a 15-minute walk) from the Indian Ocean and some excellent surfing beaches, as well as a glut of world-class restaurants and stylish bars in nearby Petitenget and Seminyak. Villa Surya Damai is located at the edge of the peaceful village of Umalas, one of a group of small rural communities that constitute the Kerobokan district, just north of bustling Seminyak. Umalas is home to a growing number of foreign-owned residences and traditional dwellings as well as the popular Umalas Equestrian Resort. 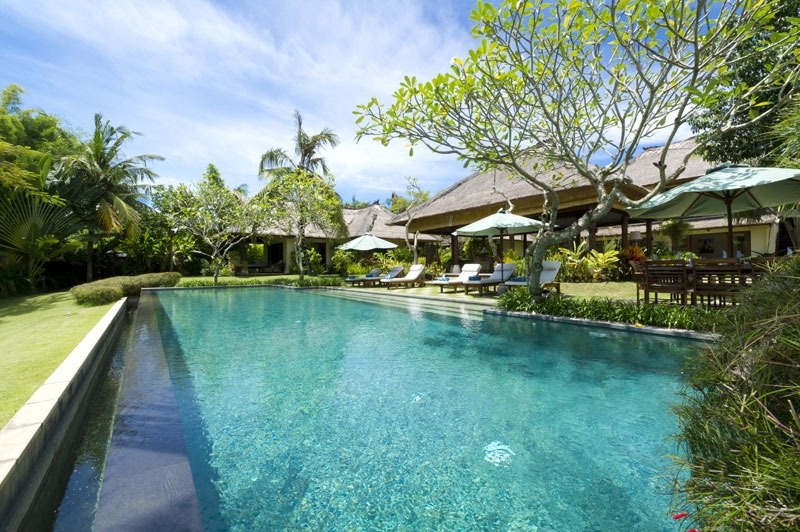 The villa lies off a narrow lane that runs across a small bridge and dissects the rice fields. To the side of the villa, immediately outside the front wooden entrance doors, is a field of grazing cows. 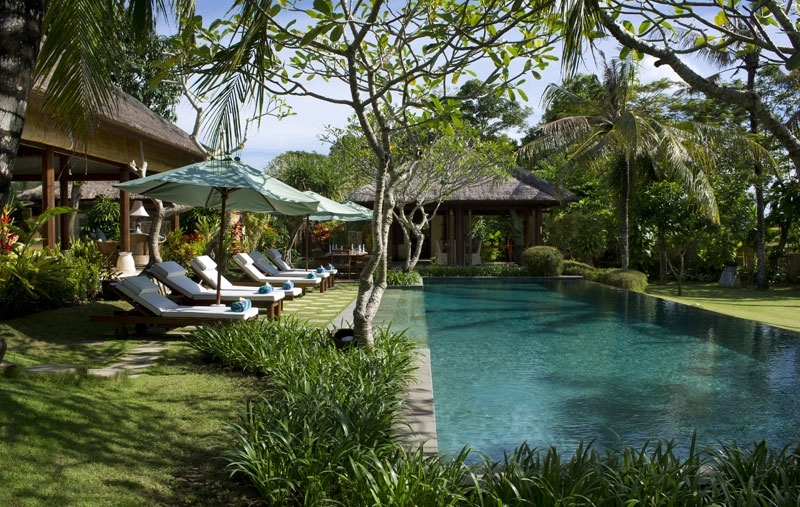 A pleasant 15 minute or so walk through farming communities and rice fields brings you to the nearest beach, Batubelig. Great for surfing, this black sand beach, like many along this southwest coastline, has strong currents, so is not advisable for swimming. 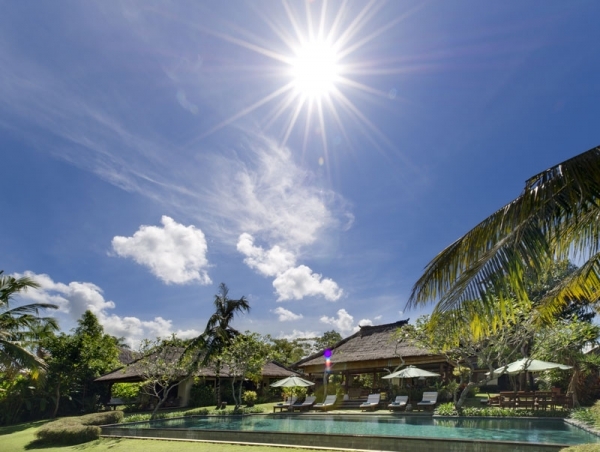 For calmer waters and more developed beachside amenities, head south to Legian Beach’s golden sands, around 30 minutes away. 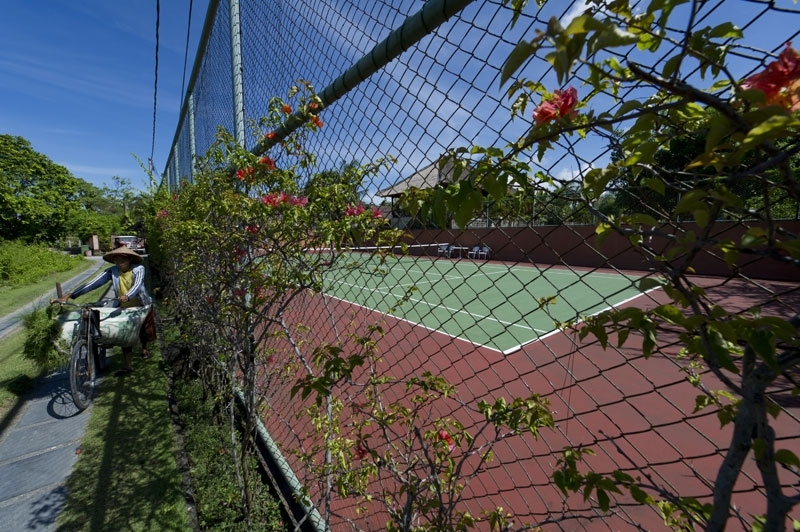 Sports enthusiasts should head to Bali’s prestigious Canggu Club (a 5-10 minute short cut through the rice fields or 15 minutes by car) with its state-of-the-art gym and tennis and squash courts. After work-outs, reward yourself with gourmet goodies at the nearby Deli. A string of naturally beautiful beaches, some renowned for their surf, are all within relatively easy access along this southwest coastline. Nearest is Batubelig Beach, around 10 to 15 minutes by car, but for the area’s premier surf, head to legendary surfer’s haunt, Echo Beach (8km), which also provides handy post- surf sunset drinking. Whichever beach you choose, all are in prime position for fabulous sunsets. Alternatively, if you want to learn to surf, head down to Legian Beach, (25-30 minutes drive) and its Double Six area, home of reputable Rip Curl School of Surf. With the surf school’s long experience and Legian’s manageable waves and sandy bottomed seas, this is a great spot for novice surfers, plus excellent brunches along the beachfront. How convenient! 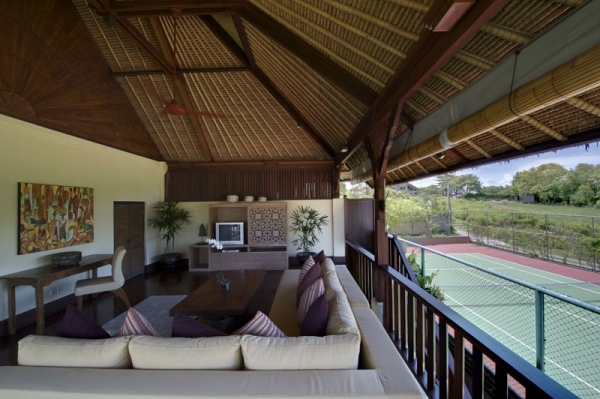 Bali’s first horse riding stables (established 1995), Umalas Equestrian Resort is a neighbour. 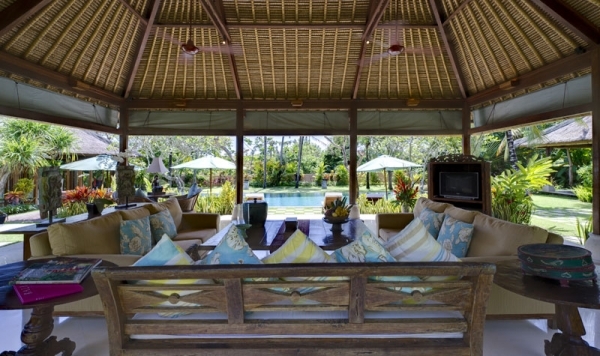 These stables offer small group horse-riding tours through local rice fields, along Batubelig Beach and picturesque villages, as well as children’s pony rides. Built in traditional Indonesian-style, with amazing antique wood dwellings, eco-friendly Desa Seni Village Resort (a 5-10 minute short-cut through the rice fields or 15 minutes by car) hosts excellent yoga and spiritual workshops in open-air pavilions. 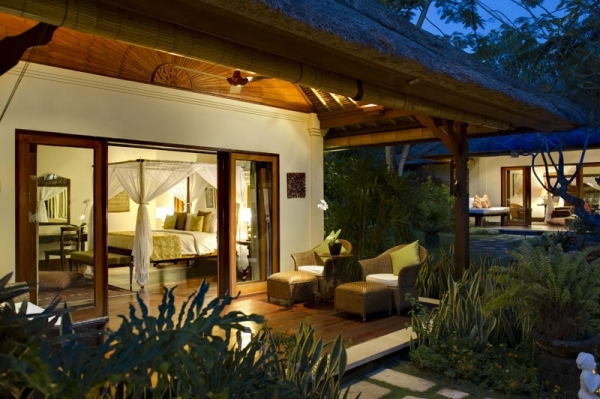 This acclaimed resort also boasts a health-giving, organic restaurant in rustic surrounds. Fashionistas, trendies and shop-a-holics should hotfoot it down to Bali’s hippest suburb, Seminyak, a 20-25 minute drive south. 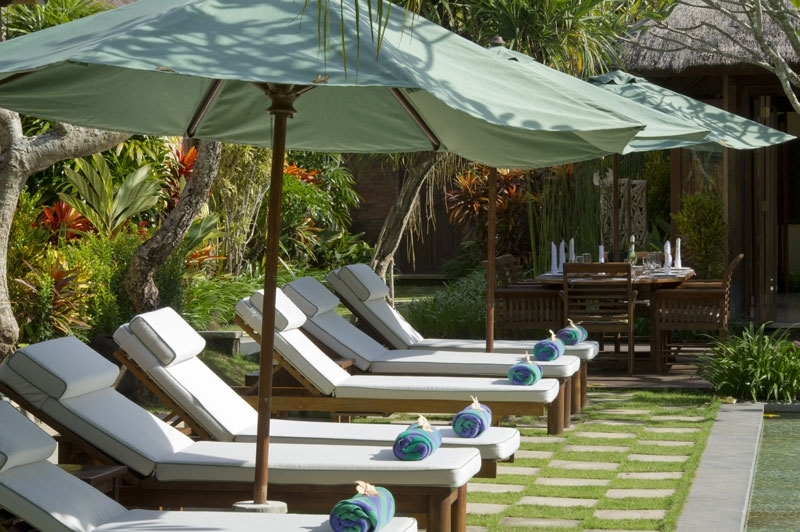 Here, you can indulge for hours in the global-inspired gourmet restaurants, stylish designer boutiques and chic bars – including much hyped Ku Dé Ta, on Seminyak beachfront. 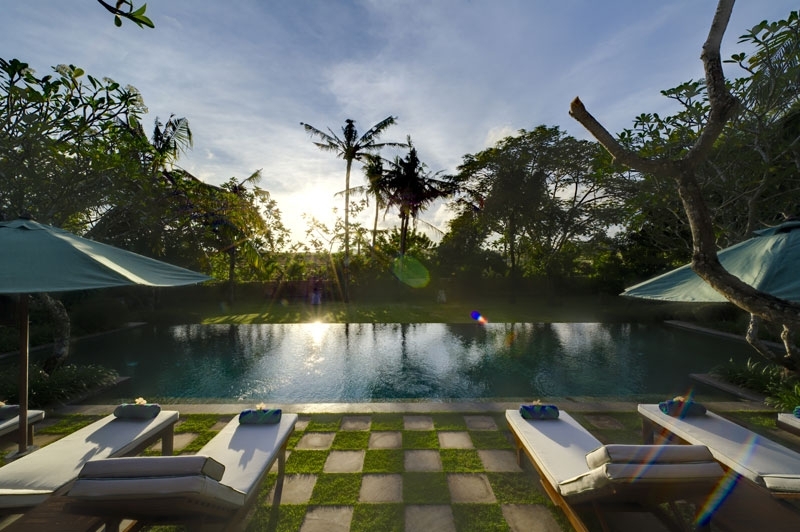 Drive westwards to explore the unchartered West Bali region, where the charming Tabanan Regency reveals terraced rice fields of emerald green, volcanic mountains and black sand beaches dotted with fishing communities – treasures that Bali is famed for. For a day of culture and dramatic landscapes, drive directly north from the villa for a couple of hours, up towards the mountain town of Bedugal. From here, explore three volcanic lakes, including Bratan, with its photogenic and stunningly positioned Pura Ulun Danu – one of Bali’s most important temples.